Things were going well for the Wright brothers in early 1909, following their first public flights in America and Europe. The U.S. Congress, the Smithsonian Institution and the Aero Club of America all wanted to award them medals, to be presented at the “Wright Brothers’ Home Day Celebration” in Dayton, Ohio, on June 17-18. The Wrights, though, wanted none of it. “The great carnival,” writes Crouch, “included receptions, spectacular parades, band concerts, and fireworks featuring pyrotechnic portraits of Wilbur and Orville, intertwined with the flag, eight feet tall…. A gigantic ‘living flag,’ composed of schoolchildren dressed in red, white, and blue, topped off the festivities with a serenade.” The event concluded with an automobile parade. Lot 68, by artist Hans Rudi Erdt, is expected to bring between $12,000 and $18,000. Image courtesy Swann Auction Galleries. This extremely rare poster is expected to bring between $10,000 and $15,000. Image courtesy Swann Auction Galleries. The third and final poster up for auction is the rarest of all. By René Hermann-Paul, the drawing depicts a Wright brothers’ airplane flying at the Aérodrome de Cannes in early 1909. It was flown by Count Charles graaf de Lambert, who was trained by Wilbur Wright and was the eighth person in France to obtain a pilot’s license. The Wright biplane featured in the poster was constructed by Ariel, the exclusive producer of the Wright brothers aircraft in France. The poster has come up for sale only once before that Lowry can recall. “Hermann-Paul was a very famous artist at the time,” Lowry says. “He mostly did music hall stuff, so this is very atypical for him.” Hermann-Paul must have been interested in aviation; one of his other works is a portrait of Wilbur Wright. 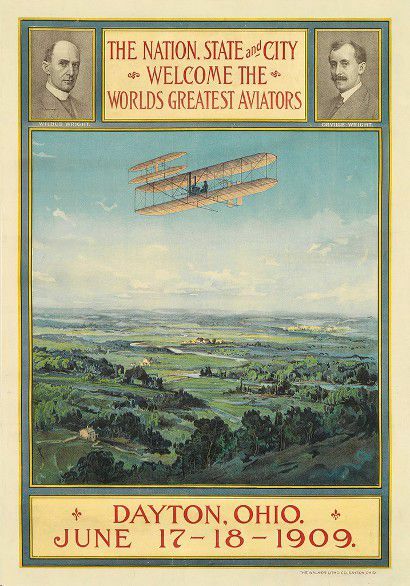 Do other Wright brothers posters exist? Lowry thinks for a second, then replies, “Actually, off the top of my head, I can’t think of any other ones.” The Dayton poster actually came to Antiques Roadshow in 2009; watch Lowry’s appraisal here.